What you see is affected by what you know, and what you hear, and what you touch, and vice versa. This is an example of multi-modal perception. The brain is very complex, and all its different parts integrate and share information acquired from any source - eyes, ears, touch, memories, predictions, expectations, Facebook, etc. We often think pain relates only to “issues in the tissues” but in fact other sources of information about the state of the body matter as well. It's all connected. I am currently reading a great book by Robert Kurzban called Why Everyone (Else) is a Hypocrite. The title is a little bit misleading, because the book is not so much about explaining why people lie, but more about working through implications of the modular theory of mind. Kurzban is an evolutionary psychologist, and one of EP’s main theoretical claims is that the mind is modular, meaning that it evolved to have certain specific competencies, as opposed to a general all-purpose problem solving intelligence. This idea is best understood in reference to creatures that are far less intelligent than humans, such as spiders. Spiders are architectural geniuses when it comes to building webs, and are also very good at solving problems related to getting food, avoiding predation, and finding mates. But outside these specific contexts, they are idiots. Kurzban’s interesting twist on this idea is that the different modules don’t necessarily share information with each other. They often work independently, and mistakes in one area can’t necessarily be corrected by more accurate information in another. He uses two common visual illusions to illustrate. What do the dots in this picture show? If you don’t already know the answer, you might struggle for a few minutes before you "see" the dalmatian. As soon as you know what's in the picture, you can see it almost immediately, and in fact it becomes hard to "unsee" as well. According to Kurzban, this means that a conscious module in the brain shared information about the picture with a visual processing module, and this affected its computations and therefore your perception of the picture. For similar reasons, this is why wine tastes better when we think it is expensive, and pain hurts more when we think it is caused by major damage in the body, as opposed to some innocuous healing process. But “top-down” information sharing won’t always change your perception. Consider the checkerboard illusion. Squares A and B are actually the same color! There is a visual processing module that processes a ton of information to provide you with this (incorrect) perception. It considers the location of the cylinder, the shadow that it casts, the regularity of the squares on the checkerboard. Based on all of this computation, it “decides” that the squares are different colors, and therefore you see them that way. You are never provided with the "raw data", the set of assumptions, or the thinking process that led to this conclusion. You just get the final product - a mental picture showing the squares as the same color. And, interestingly, your conscious knowledge that the squares are in fact NOT the same color does nothing to change your perception. 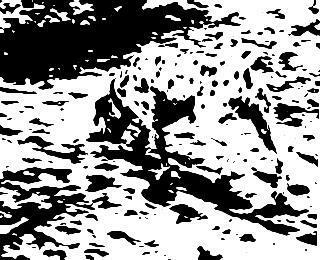 Unlike the dalmatian photo, conscious knowledge is not used by the visual processing module to make your perception more accurate. So the illusion remains. According to Kurzban, this is evidence that the work done by the modules is often fairly independent, immune to correction or maybe even input from other modules that know better. Now consider this idea in the context of pain. Sometimes our knowledge and conscious thought processes about the body will affect how a body part feels. If we think that a body part is broken, degenerated, falling apart, unstable, this can make pain worse. And if we think that our body is robust, strong, and capable, this can make us feel better. This is multi-modal perception - sharing of information between the different modules. It explains why in the Dalmatian picture, conscious knowledge about the meaning of the picture affected our perception. But pain is unfortunately sometimes more like the checkerboard illusion - immune to logic. People often have pain in areas where there is no damage, and sometimes in areas where there aren't even body parts! Having conscious knowledge about these facts sometimes cannot affect perception. In terms of modules, we could say that the pain module is just not very interested in hearing corrective information from the cognitive modules. It was designed to be strategically ignorant about their conclusions. This is frustrating, but I think an interesting theoretical way to look at the problem of pain having "a mind of its own." If the pain module won’t “listen” to the more cognitive modules, which modules might be better at speaking its “language?” The movement modules would be first on my list. If you move in a way that demonstrates strength, endurance, or skill, you will get a visceral “bottom-up” feeling of safety that speaks a different and more powerful language than Stuart Smally-style top-down daily affirmations.